Within the magnetic spectrum, some rays, such as light, can be seen by the unaided human eye. Most, however, are totally invisible to us. Far Infrared Rays (FIR) are well beyond the ability of the naked eye to see. FIR is capable of penetrating deep into the human body. It can gently and delight-fully elevate the body's temperature. When it does so, it helps to expand capillaries, which stimulates blood circulation. This increases the body's energy reserve, and accelerates the metabolic exchange between blood and body tissue. That's not all! FIR can actually increase the body tissue's regenerative ability. It also gives the body a feeling of well-being. Needless to say, now that FIR's outstanding properties are gaining worldwide recognition and acclaim, we are beginning to see it appear in a wide variety of medical applications. Are you giving enough thought to your own health and that of your family? Are you satisfied with your present condition --- no complaints or concerns? It is important not to overlook the importance of a daily, routine health maintenance program! It is certainly better to avoid a health crisis than it is to have to treat one. This FIR HotHouse Health Builder produces its unique effect through radiant FIR heat. Its unique arched design enhances the thermal effect. 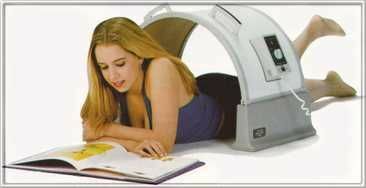 You get total enjoyment-it is completely safe and very comfortable. FIR radiation reaches deep into your body-anywhere and everywhere you want it to. It makes you feel absolutely terrific- blood circulation increases, metabolism is improved and your internal organs are stimulated. Why are we hearing so many wonderful and positive things from the many devoted users of the Health Builder? Because the FIR HotHouse Health Builder really works- maintaining general health and thus promoting confidence in your body's health. If you have been suffering from chronic ailments for a long time give this a try! See for yourself if it can restore your lost Vitality. Manufactured under a Japan technology patent, this FIR Health Care and Health Builder has earned popular and professional acclaim in Japan after many successful clinical trials. The Importance of 8~10 micron Far Infrared Ray: Normal human body temperature is 98.6 degrees. Most of our body heat is typically radiated away as far infrared at the 8 ~ 10 micron wavelength. (That is why a room full of people becomes warm.) So, if we generate 8 ~ 10 micron far infrared and direct it at a human body, it matches the radiant energy leaving the body and as much as 99 percent is absorbed below the surface of the skin. Through this principle of using complementary rays, the absorption of radiant energy stimulates the flow of blood throughout your whole body and energizes your metabolism. 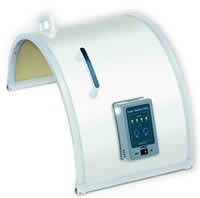 Using far infrared rays from the complimentary 8 ~ 10 micron wavelength is best for the body's overall comfort. Why the Deep, Penetrating Thermal Action? The "Super Radiant Heating Surface" is covered with a very fine multi-faceted acute-angle silicon surface manufactured in New Mexico. When rays are scattered in all directions by the countless surfaces created by the silicon crystals, the effectiveness of the 160 degree span is even amplified. The radiant transmission area is increased some 10-fold. It simply wouldn't be possible to generate levels of FIR energy high enough to produce the effective results we achieve without the combination of these two design concepts: proper wavelength and a special reflective silicon surface. Though the radiation surface is capable of reaching 75 degrees C (167 degrees F), the temperature is automatically controlled by a built-in, specially designed regulator, which only allows a set temperature while a safety device precludes any chance of overheating from a malfunction. The SUN HARMONY FIR Hothouse Health Builder performs its thermal treatment without ever having to touch the afflicted area. Just set the timer and relax. So simple and convenient! What's more, it consumes a mere 5 cents worth of electricity per hour. This is NOT like the huge FIR instruments you may have seen in hospitals. Ours is entirely new and sized just right for home use. You will be thrilled with the Health Builder's unique qualities. It is a must for yow home! 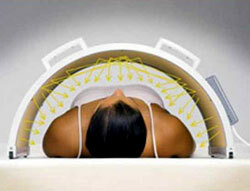 The 160 degree arched design greatly increases the radiation coverage and enhances its absorption. This unique design is the hallmark of the Health Builder. FIR Hothouse is registered with Food And Drug Administration as Class 1 Medical device. Regular Hot House Weight and Measurements. Extension stands: 6 1/2″ each - Placed on either side will raise height to 18″ if desired. Grande Hot House Weight and Measurements. Extension stands: 6 1/2″ each - Placed on either side will raise height to 24″ if desired.